HANA base SAP Business One cloud landscape general error; 10 authentication failed. When this error came up the HANA user is locked regarding bad login attempts. 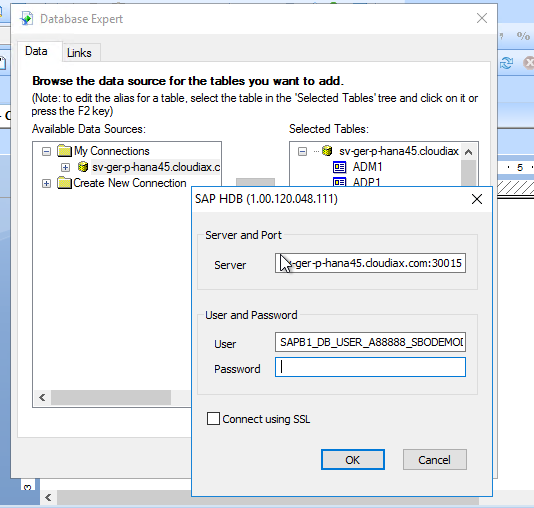 In SAP Business One cloud every single tenant (SAP B1 database) has his own HANA user this is used for the connection. The system prompts this user sometimes when you edit a CR or a HANA connection for an Addon is made. The system defines it as the default user and will prompt it in such database connection fields. This is the default SAP Business One cloud design and not a Cloudiax made configuration. Please be aware that end users can lock the system by trying to connect with this user. This is the case in 99% this issue came up. The password for this user is handled by the system itself and stored as an encrypted hash in the SLD database, which means we cannot provide it or even know it. The underlying HANA system has a security mechanism that locks the user after 6 bad logins for 60 minutes to avoid abuse. You can unlock the user in the CCC, if you don´t have access to the CCC please open a request and we unlock the user.